The Federal Communications Commission today officially proposed to add up to 195 megahertz of additional spectrum in the 5 GHz band (a 35% increase) available to unlicensed wireless devices. The Notice of Proposed Rulemaking would open up 195 MHz of additional spectrum at 5350-5470 MHz (120 MHz) and 5850-5925 (75 MHz), with the use of spectrum-sharing technologies envisioned as one way to make the spectrum available to private as well as federal entities. Today the 5 GHz WiFi band operates in 555 megahertz of spectrum, and is used for short range, high speed wireless connections including Wi-Fi and fixed outdoor broadband transceivers used by wireless Internet service providers for backhaul. The U-NII band covers 5.15-5.35 GHz and 5.725-5.825 GHz range and is designed to allow for higher data rates via the 802.11a standard. 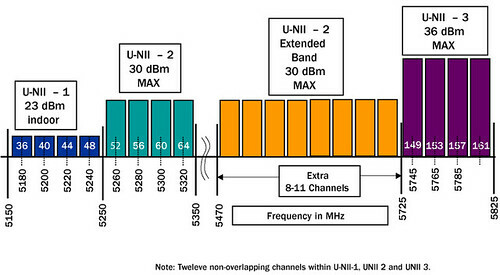 The 802.11a standard defines 12 fixed, nonoverlapping channels for use in the 5.0 GHz U-NII band. 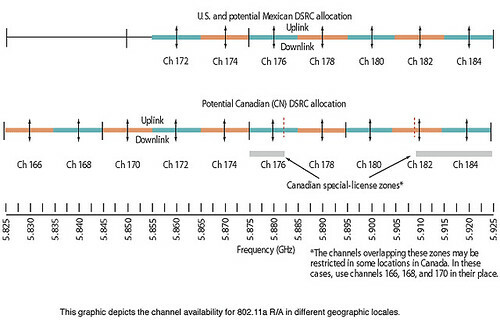 Wireless ISPs generally use 5.725-5.825 GHz, which allows for higher power. The FCC seeks comment on making available an additional 195 megahertz of spectrum in the 5.35-5.47 GHz and 5.85-5.925 GHz bands for U-NII use. The proposed modifications would provide access to additional contiguous spectrum with consistent technical requirements, allowing unlicensed devices to use wider bandwidth channels, leading to faster speeds. The agencyâ€™s five commissioners also expressed hopes that the new unlicensed airwaves would unleash further innovations, just as unlicensed spectrum in the past has made possible such devices as cordless phones, garage door openers and television remote controls. After a public comment period, the commissioners will try to devise final rules and regulations, a process that could take a year or more. But all of the commissioners expressed hope on Wednesday that the new airwaves could be put to use without unnecessary delay. But some government agencies are not enthusiastic. Lawrence E. Strickling, assistant commerce secretary for communications and information, said in a letter delivered late Tuesday to the commission that the Pentagon, the Department of Homeland Security and NASA each used parts of the same airwaves for communication between aircraft and ground stations. Those communications enable activities like drug interdiction, combat search and rescue, and border surveillance, Mr. Strickling said. The Intelligent Transportation Society of America, a trade group representing automakers, uses part of the spectrum for vehicle communications. On December 17, 2003 the Commission adopted the Dedicated Short Range Communications (DSRC) Service in the 5.850-5.925 GHz band for the Intelligent Transportation Systems (ITS) Radio Service (5.9 GHz band). The DSRC Service involves vehicle-to-vehicle and vehicle-to-infrastructure communications, helping to protect the safety of the traveling public. Julius Genachowski, the F.C.C. chairman, said he was confident that the commissionâ€™s engineers would be able to work with the affected government and private entities to solve interference problems. Part of the impetus may actually be coming from cellular carriers. Coverage in dense urban environments will require lots of small cells on streetlights. Backhaul is the problem. Only sub 6 GHz frequencies are likely to deliver the point to multipoint and non line of sight performance required in urban canyons — and unlicensed spectrum is “free”. The National Cable & Telecommunications Association approved of the FCC’s move. According to the NCTA, the five major U.S. operators involved in a Wi-Fi roaming pact have already deployed more than 100,000 Wi-Fi hot spots. 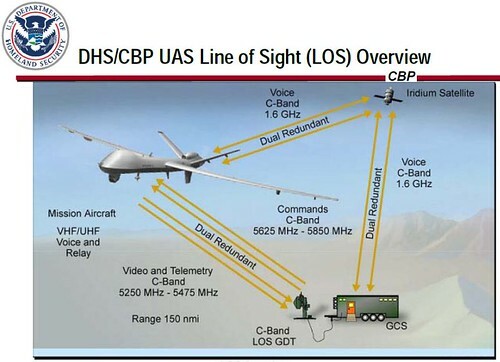 Then there are the drones. You can’t forget about the drones. This entry was posted in Uncategorized by Sam Churchill. Bookmark the permalink.